The compendium has a central box with two cover leaves, hinged on opposite edges of the main box. Around the four sides of the central box is the signature 'CHRISTOPHORVS SCHISSLER FACIEBAT AUGVSTAE VINDELICORVM ANNO DOMINI 1566 IAR'. The outer face of the top cover carries a wind rose with a wind-blowing cherub head in each corner of the leaf. Sixteen directions are indicated and named in German. The eight principal directions are also marked for the character of the winds and the weather they bring: 'NORD SCHEN KALT TRV:', 'NORD OST SCHEN KAL:', 'OST WARM HEL TRVCK', ' SVD OST MITEL MES:', 'SVD WARM REGNIG', 'SVD WEST REG. FEYC:', 'WEST KALT NEYBLIG', 'NORD WES: SCHNE VNC:'. There is a central hole for a wind vane, but none survives. 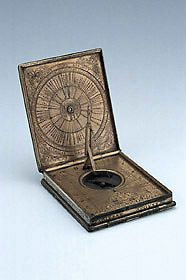 The reverse of the cover has a circular table giving the compass bearing of 90 towns from Augsburg. The double scale of names are arranged around a small central vignette of the riverside view of a city. Surrounding the town names is a circular scale of degrees 0 to 360, divided to 10 and 2 and numbered by 10. The degree scale begins at the south point of a scale of 12 wind directions which encircles the degree scale. The names are in German, with the east and west names omitted for lack of space. Schissler's 12 point naming system conflicts with the 8 point scheme; with the former, north east is 30? from the meridian, with the latter 45?. As with the outer face of the leaf, the four corners are again decorated with engraved wind-blowing cherub heads (of a slightly different design). The central box carries a horizontal sundial marked for 'ELEVAT. POLI 48'. The hour scale runs 4 to 12 - 8, divided to 1/2 and 1/4 and in the night time portion there is strapwork engraving and deeply cut foliage. The dial has a string (actually catgut) gnomon with a folding support. The string is spring-mounted to keep it taut: at one end it is looped over the end of the support and held in a notch, while at the other it passes through a hole in the dial plate and winds around a barrel containing a watch spring. The support itself is mounted on a silvered, ring-shaped spring fixed on the underside of the plate. It is held vertical by its own folding strut which slips into a notch projecting over the glass of the compass. The compass is placed in the centre of the dial's hour scale. The diameter of the bowl's base is 32 mm and the silvered base plate has a direction cross marked 'SE', 'ORT', 'ME', 'OCC'. A faint indication of compass variation appears to have been added later, as does the needle. Except for the ring spring, the underside of the dial plate is decorated with acid etched foliage, unlike the engraved ornament on the rest of the compendium. The inner face of the back cover has a lunar volvelle. Set within engraved foliage the outer fixed ring is titled 'INCREMENTVM ET DECREMENTVM LVNAE', surrounding a scale of hours I to XII, I to XII, each hour divided to 1/2 and dotted for 1/4s. The silvered volvelle has a cut-away edge to reveal the fixed scale of the age of the moon 0 to 29[1/2]. Around the circumference is a scale of hours 1 to 12, 1 to 12, each hour divided to 1/2. A circular aperture reveals a diagram of the phases of the moon with a face engraving for full moon. The centre of the volvelle carries an aspectarium with polygons and symbols for trine, quadrature and sextile. The back cover has a horizontal pin-gnomon sundial with lines for unequal hours 1 to 11 ('HORAE PLANETARVM DIEI') and for Italian hours 9 to 23 ('HORAE AB OCCASV SOLIS'). It is surrounded by engraving of birds and foliage.